The Pittsburgh Penguins are used to vying for season ending awards. Some, like the Art Ross Trophy, Hart Trophy, and Ted Lindsay award have long and storied histories of finding their way into the hands of Penguins players. Others, like the Norris Trophy, the Vezina Trophy, and the Jack Adams Award Jack Adams are infrequently associated with the franchise. But as the season winds down and the dust comes close to settling on the year, there's a potential finalist that no one could have seen coming before the puck dropped on opening night. The Jack Adams Award is "presented by the National Hockey League Broadcasters' Association to the NHL coach adjudged to have contributed the most to his team's success." 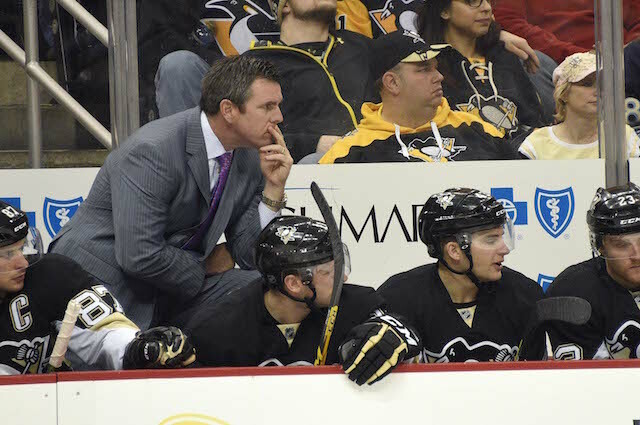 Without question, when looking around the league, there's no one who exemplifies that criteria more than Mike Sullivan. Mike Sullivan will have only coached a partial season, but instead of hurting his chances of taking home the award it should only serve to stress just how important he's been to Pittsburgh's success. The Penguins were listless and ineffective under former head coach Mike Johnston through the first 28 games of the season. A team many in Pittsburgh hoped could make a deep playoff push after addressing their forward depth in the offseason was playing poor hockey while trying to force talented offensive players into a restrictive system focused on shoring up the team's weakness (defense) instead of playing to their strengths (offense). Johnston was fired in the middle of December, and things immediately began to change under Sullivan. What was a below average possession team for Mike Johnston immediately became a force to be reckoned with under Mike Sullivan. The Pens began forcing play towards the other team's net from the first game of his tenure, even if the first 4 games of his tenure all ended in defeat. Things were looking so bleak back then, as Pittsburgh was in 12th place in the Eastern Conference, 6 points out of a playoff position, and on pace for just 85 points. They were looking to have a better chance to win the draft lottery than playoff games, but the team continued to improve under Sullivan and have gotten stronger with each passing month. Those 12th place Penguins now sit 4th in the conference with a handful of games remaining, and they have a legitimate shot to get as high as 2nd before the regular season ends. The offense that Johnston had been holding back has gone from 2.39 goals per game under their former coach to averaging 3.13 goals per game under Sullivan. They might be allowing slightly more goals against, going from 2.39 GA/gm to 2.53, but the change has been minimal as Sullivan has opened things up, and the difference in goal differential is telling. While Johnston's team had scored the same number of goals as they had allowed, the Penguins have a +28 goal differential since Sullivan took over. That's good enough for 6th in the league despite taking the entire first third of the year off. And perhaps most important of all, the underlying possession numbers. The Penguins were 19th in the league when Johnston was fired with a 48.3 SACF%. They've been 2nd best in the NHL in his absence with a truly elite 55.5 SACF%, and they continue to improve with each passing game. Mike Johnston is now 27-15-5 as the Penguins head coach, which would be good for 103 points if extrapolated over a full season. The team has continued to improve over his tenure and are playing better than possibly anyone else in the league right now, having gone 8-2-0 over their last ten games while absolutely dominating some of the toughest teams on their schedule. He's taken a weak defense and turned them into a unit that can support an elite offense while not allowing too many goals in their own end. And he's done that while taking off castoffs from other teams like Trevor Daley and Justin Schultz and utilizing them in a way that highlights their offensive talents and masks their defensive deficiencies. More importantly, he's pushing all the right buttons and has rejuvenated this team to the point where they believe they can beat anybody and go out and back up that mindset. Barry Trotz might have Washington atop the standings, Bruce Boudreau might haveve overseen a similar mid-season resurgence in Anaheim, and Gerard Gallant might have the young Panthers contending ahead of schedule, but there's no head coach in the league who's contributed more to his team's success than Mike Sullivan, and he deserves to take home the 2015-16 Jack Adams Award.